We have taken what was generally considered a male-dominant, underground and elite sports domain… and created an accessible fitness platform for everyone to experience. Men, women, beginners, advanced, amateur boxers and pros. No egos, no attitudes, it’s more about a group of people who are there to have fun and go hard! We cater for the excitable 17 year old and the energetic 70 year old… and every fitness level in between. Our coaches are personable, friendly and the best in the business. Their primary goal is to assist you in being the best you can be, to raise the quality of life through fitness, confidence and a sense of belonging. 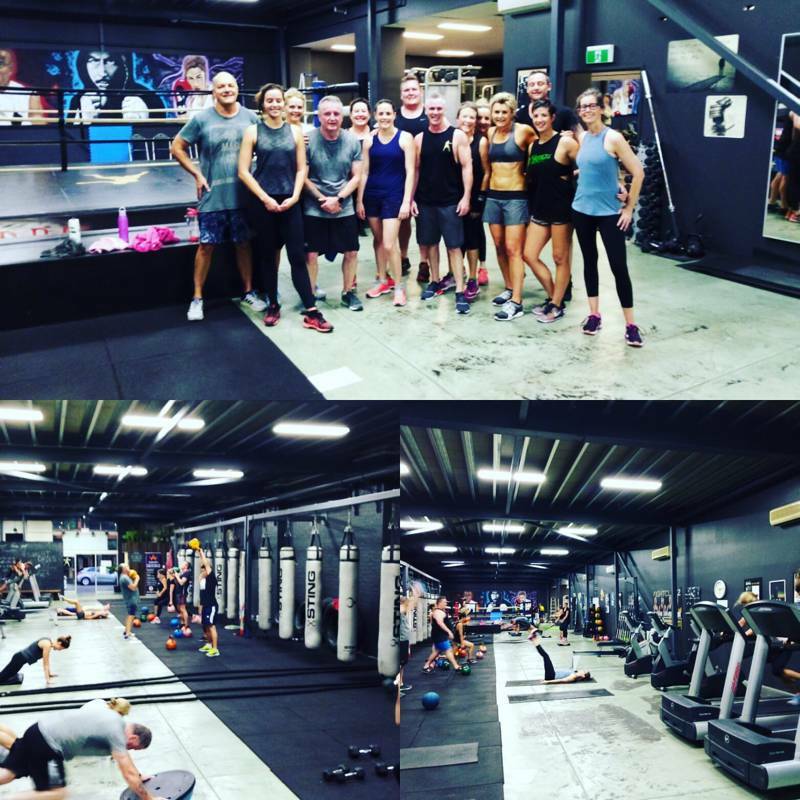 Each of our Group Classes are an intense, ultra-calorie burning and super charged metabolic workout for up to 30 people in a friendly and empowering environment. You go hard enough… you’ll burn over a 1,000 calories. Our Personal Training is built around contemporary power conditioning disciplines that challenge and fast-track your fitness goals. Our Nutrition is geared towards making permanent changes to your eating habits that will complement your training and help achieve your optimum health. In a saturated health and fitness market dominated by aimless and unsupervised 24/7 gyms, people are looking for more variety, personal attention and professional guidance. We focus on contemporary training techniques, explosive interval-based activities and more of the things you might not expect to see at a conventional gym. But expect to be challenged, expect to see change and expect to be served by some of Brisbane’s leading fitness professionals. WHAT WE OFFER GOES FAR BEYOND TECHNICAL SKILL, HIGH-PACED CARDIO OR ON-ON-ONE TRAINING… WE AIM TO HELP YOU LIVE YOUR LIFE AS A CHAMPION. Boxing and Martial Arts have been undergoing a renaissance through media channels Ultimate Fight Competition and reality-based TV shows like The Contender. Sporting clubs, coaches and people like yourself are looking at the disciplines to supply and satisfy different parts of their fitness requirements. With that in mind, BOXR has created 4 separate training zones: there’s an area hung with 16 uniform 6-foot Punchheavybags and floor-to-ceiling balls for striking; an open floor space of 120sqm for padwork, plyometrics and interval-based training; a fully-sprung 20-foot Zebracompetition ring for more competitive work and a free weights area loaded with Hammerstrength and Lifefitnesscable and cardio equipment. 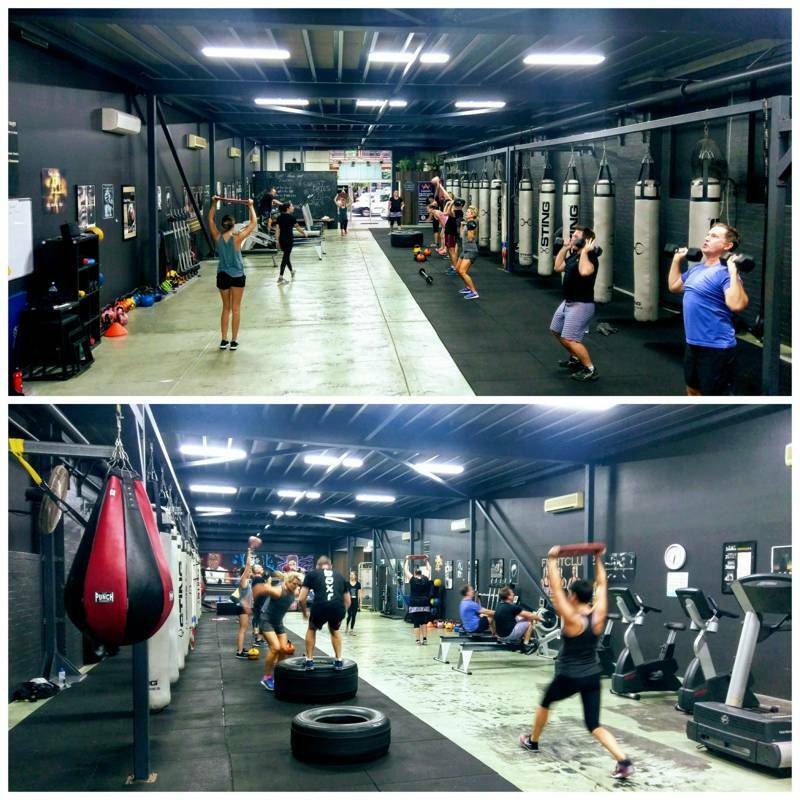 Our group classes and PT’s are coordinated in each of these training zones, we’ll mix things up as much as we can. In classes you could have 10 people on the bags, 10 on the floor with pads and 10 in the ring working on their agility and footwork, rotating through timeframes set. PT’s can be a matrix of supersets, cardio and plyometrics. The key to our culture is built around non-repetitive combinations of strength, speed and endurance. You will not find any commercialised exercise programs in anything we do. Our challenges are more specific group programs designed over 8-week blocks. We offer weight-loss courses, competitive fight formats and adventure training throughout the year. BOXR is also affiliated with Boxing Queensland registered as amateur boxing club. Our registered boxing coaches are Craig McKim, Russel Finn, Will Tochez and Ian Jacobs. EACH OF OUR COACHES HAVE THEIR OWN DELIVERY AND STYLE, EACH OFFER SOMETHING UNIQUE TO OUR MEMBERS. Bring what you’ve learnt from our BODYBLOW classes to the floor in a more competitive format built over 8 weeks. Learn more about setup and stance, offensive and defensive skills, speed and power. Test your will against others in a carefully coached program. Your stamina, speed and durability will be tested at the end when we match participants according to age, weight and experience in 3 x 2 minute bouts held over a fully catered Friday night in Toowoomba 2 August. Our first BOXR Fightclub Challenge not only serves as an opportunity for you to test yourself and the skills you’ve learnt at BOXR against a real opponent in a real fight environment, but you’ll be supporting the Queensland Downsyndrome Association. The ability to produce force. The ability to continue to perform a skill or action for long periods of time. The ability to produce strength in the shortest possible time. The ability to change direction quickly. The ability to stretch the joints across a large range of motion. The ability to withstand physical punishment over a long period of time. The ability to react quickly to sensory perception. The ability to evaluate and react appropriately to strategic situations. BOXR works with suburban soccer clubs, tennis professionals through to elite ultra marathon runners and footballers. Our sessions can be designed to accommodate any code of sport or sporting endeavor. Every athlete is gifted with their own core skill sets, but we can sharpen any aspect their sport demands through boxing. If it’s one-on-one training you need or periodised programs over a pre-season, we can help you plan a more specific formula for your field of sport.